We, logically, will start from the spot we end the previous day. If we haven’t reached the Pancake Rocks then, this will be our first visit for this morning. Before this, we would pass by spots like Hokitika, the greenstone capital, and Franz Joseph Glacier, which we only will watch. 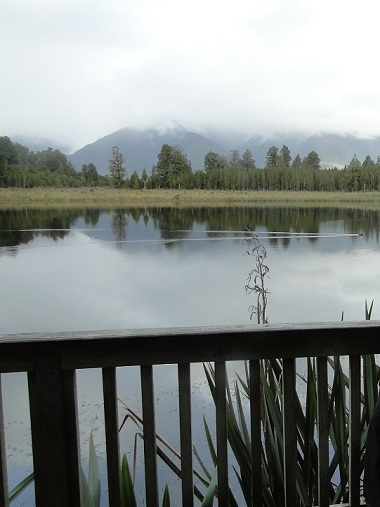 Close to Fox Glacier is the path to Lake Matheson, one of those lakes in New Zealand with an amazing reflective quality: it’s a mirror. 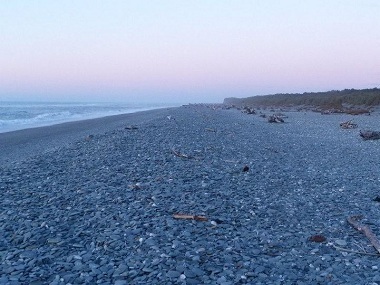 Then we will drive to as close as possible to Haast. The route for this day is about 300 Km long, which can be covered in 3 hours and 40 minutes. We start early today as our target is being at Fox Glacier by 14:30h, the time for the last tour. So at 7:00h we leave the Holyday Park for a short drive to the Seal Colony. The woman at desk has guaranteed 100% we’re going to see seals in there. When we park there is another animal which take our attention first: a sort of “chickens” came out from the bush to shamelessly looking for – based on the chase they do to our bread - food. Later we will know the name of these birds is Weka. We play with them for a while before taking the path, through a forest of yuccas - or a similar plant – and spectacular views to wild coast with beaches and rocks. The seals are there indeed, but their natural camouflage makes us need some time before start to seeing them over the rocks. There are some young ones, as the one in the picture. They’re fantastic and we keep watching them for a good while before deciding to leave this place to reach the spot we should get yesterday: the Pancake Rocks. We’re still out of the map at the beginning of the page. After one hour driving we can finally appear at that map and park in the Pancake Rocks area composed by the parking itself, a restaurant and an i-site which is also a gift shop. 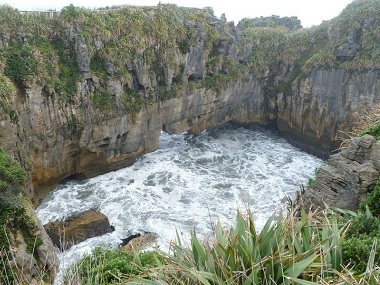 The entire name of the place is “Punakaiki Pancake Rocks and blowholes” and coming here this morning is going to be better for our visit than it had been yesterday afternoon as now is high tide and that makes the surname of this place to work: the blowholes. They’re basically holes in the rocks which, when the waves are hitting them strong enough, can act as geysers. We meet again with these yuccas at the sides of the path leading to the coast. There, the Pancake rocks can be seen, strange and fantastic, which looks magnificent with the coast landscape at bottom. We like a lot this visit. Next thing to do is clear: we must book the glacier tour for this afternoon as there is an i-site just here and we’re going to drive now directly to it. Somehow, we’re attended by three smiley girls at i-site desk which keep telling us there is impossible reaching Fox glacier on time for the tour today. They even refuse calling them as we have no chance: it’s some minutes past 10 AM now and going to there is more than 4 hours’ drive. They’re locals, they’re three and they’re working giving this kind of information to the people but, even with that, I’m still thinking we can do it quite well and start our drive to South. When we’ve got 3 hours driving with no stop is clear we’re going to be in time and that’s what I was waiting for calling to book the tour from our local cell phone. Unfortunately, at that moment, I’m told there is no vacancy for 8 people today. I avoid asking if at 10 AM was place for 8 as it’s useless hating three incompetents. I don’t want to be rude, but if you’re working giving proper information to outsiders and what you say is impossible is full well done, your information was clearly wrong. And don’t talk about denying calling just in case! I’m still thinking about one last option: we can stop at Franz Joseph tour company office, which is before Fox Glacier town, and look after doing a tour there. When we stop at Franz Joseph town gas station, just besides the mentioned office, I go there, but they only perform tours at morning and they’re offering me place for tomorrow. 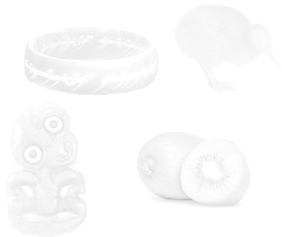 Then I need to assure something for tomorrow morning and call to Fox Glacier tours to check if we can do it with them and I’m answered again there is no vacancy for tomorrow morning. They’re going to check but I’m at the door of this office to book here at the very moment I’m confirmed I cannot do it there. Somehow, when the woman at phone is back answers me: “I’m sorry, but there is only vacancy for the tour at 8:10 AM”… (??) I don’t understand what is she sorry about at all, but as that time is perfect for us and I end using a credit card for booking it. Once the tour booking is closed we can relax. The rest of the time today is free so we walk along the main road shops making a new plan for today: we will watch this glacier and drive to the Fox one, where we can visit Lake Matheson and spend the night. We basically purchase souvenirs and some food and drive by a narrow road full of speed bumps which makes shaking the whole motorhome. Once at parking a track signed as 20 minutes long is waiting for us, so we go for our lunch first. We’re going to make a picnic just here. A couple of keas – New Zealand’s mountain parrot - appear beside us, and we know they’re famous by their skills to stealing food. When we remove the camping chairs and tables used we’re ready for following the path to the glacier’s face through a beautiful rainforest, along a stream. At the end, we get access to getting closer to the glacier over the bed of rocks left by the glacier on its slow trip backwards through which the water from it is finding its way down to the sea. The landscape with the ice tongue filling the narrow canyon in the mountains is extraordinary. We drive then to Fox Glacier town and can see the tour company building we must be tomorrow morning in the main road. Actually, we’re turning right there as we’re taking the road to Matheson Lake. This visit is going to take the rest of the daylight today. We can park and take the path, which go all around the lake in 1 hour. What is peculiar in this lake is it has got a brown color, like brandy – it could be the remains of Brandywine river –, which allows the water to be dark and, along with the quiet it is, make the surface fully and clearly reflective in the way the pictures are all horizontally symmetrical. From this place, also, usually can be seen the two highest peaks in New Zealand: Mounts Cook and Tasman, and that’s a real postcard. But today clouds are over these peaks and, therefore, hidden. An extra for this visit is the path through the forest, really beautiful, and we can get the views we want before reaching the half of the path, so we can come back by the same way saving some time. Our last step for today is camping somewhere, and I’d already chosen the place, it was in my list of free camping spots and, as it is still daylight, we can go on the road to the beach. Although it is a gravel road for the last ten kilometers, we finally reach a farm with sheep around and the motor park with water, toilettes and surprisingly quite full of campervans. The beach is as unusual as beautiful: an endless surface of flat stones, with the sea at one side, and the white mountains on the other side. We can add to all that, it is sunset time now.